Test the speed of your PC with NovaBench. 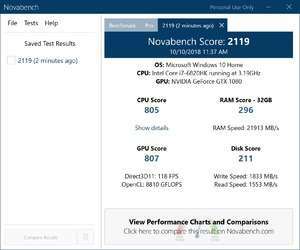 NovaBench is handy program that will allow you to easily test many aspects of your computer's speed, such as CPU speed and Graphics Card speed. After all tests are completed, an overall system score will be given to your computer. For security reasons, you should also check out the NovaBench download at LO4D.com which includes virus and malware tests. Additional screenshots of this application download may be available, too.